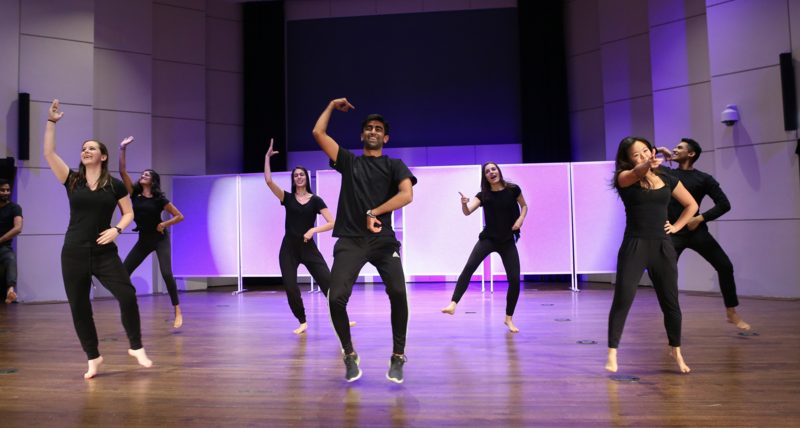 Feinberg’s Dance Interest Group performed a variety of dance styles, including Bhangra, swing, Bollywood and hip-hop. View a Flickr album with more photos from In Vivo 2018. 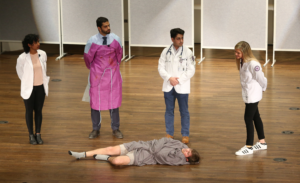 Medical students celebrated four decades of singing, dancing and laughs at the 40th performance of In Vivo, Feinberg’s annual sketch comedy and variety show. The event, held November 29, raised money for Deborah’s Place, a charity that provides supportive housing and services for women experiencing homelessness in Chicago. This year’s production lampooned the everyday experience of Feinberg students and provided commentary on student loan debt, bringing an audience of peers, faculty, friends and family to their feet with laughter and applause. The show was directed by Hooman Azad and produced by Stephan Kienzle and Ankitha Radakrishnan, all second-year students. Natalie Campbell, a first-year student, was also a producer. 2018’s In Vivo poked fun at the rigors of medical school and provided commentary on student loan debt. 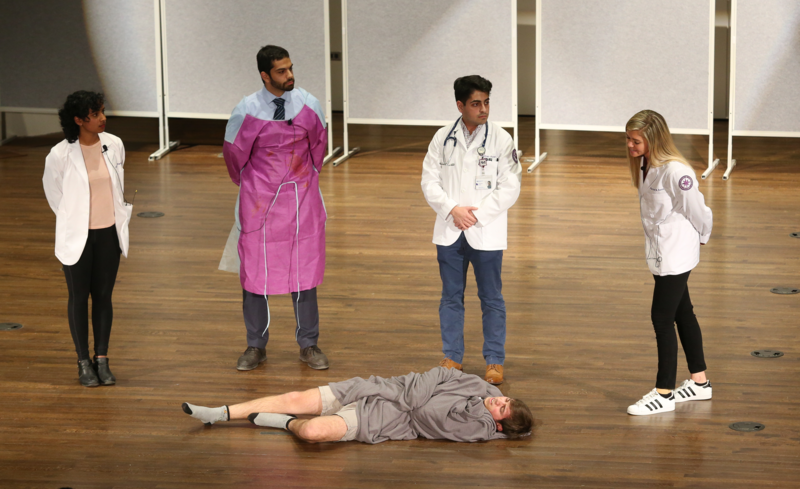 Simulated patients, the white coat dress code, study groups and the Feinberg curriculum all featured in a variety of comedy sketches and musical numbers. 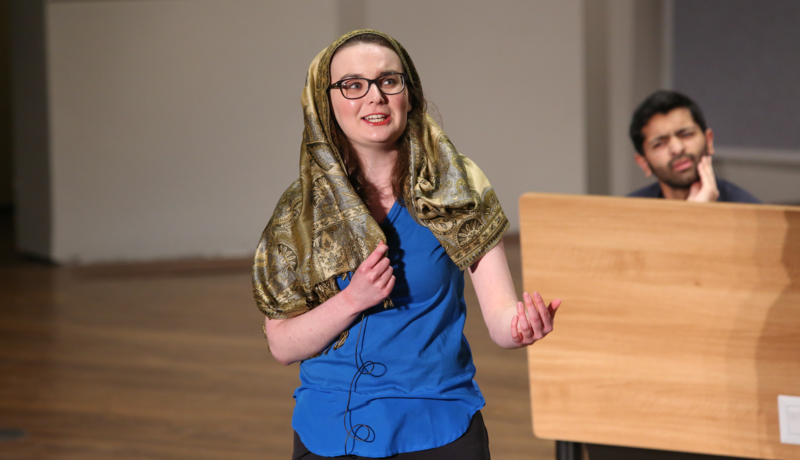 Medieval doctors extolled the benefits of leeching in “Feinberg Class of 1422,” and prospective students competed as contestants on a trivia game show. 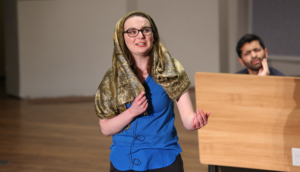 They also parodied television shows such as “Grey’s Anatomy” and “The Office,” and performed a cast-wide rendition of a musical number from “Les Misérables” — with a medical school twist, of course. The show also featured performances from Feinberg’s Dance Interest Group and the student a capella group, Docapella. Students parodied a variety of pop culture properties, including Les Misérables. Proceeds from the evening raised money for Deborah’s Place, which has helped more than 4,000 women go from homeless to housed since 1985. “It’s a fantastic local organization, and women’s issues have been at the forefront this year, so it seemed fitting,” Campbell said. The In Vivo student cast also included Paavani Reddy, Ellen Wu, Shaan Somani, Fernando Huyke, Eden Sharabi, Shaan Madhan, Rachel Bass, Arjun Sarkar, Vivian Wan, Charles Schufreider, Lauren Gabra, Emily Walsh, Nell Birch, Kimberly Chow and Tejas Joshi.